Friction between a surface and wear particles or between two surfaces cause erosion. 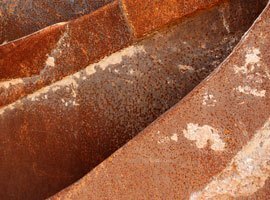 Erosion resistance is critical to a material’s durability or an application’s service life. Erosion and abrasion result in increased downtime and decreased operational efficiency. A&A Coatings offer a range of erosion-resistant thermal spraying solutions for increasing efficiency and service life of industrial applications. A&A Coatings’ plasma spraying solutions are proven highly effective in extending service life of heavy-duty industrial applications. We also use the HVOF thermal spraying process for building erosion resistance. Many of our erosion-resistant coating solutions have become the industry standards for erosion resistance and we can assess and analyze your particular erosion problem and recommend a solution based on the feasibility study. We use tungsten carbide, chromium oxide ceramic, chromium carbide and other materials to accomplish your goals. Our coating and spraying solutions are tailored towards diverse industry needs. Depending on your particular mode of erosion failure A&A can tailor a coating to specifically remedy your problem. We have dozens of different materials which can be selected to enhance the surface properties of all different types of components to ensure long service life and in most cases these coating solutions are a cost effective alternative to parts that are made out of costly materials. Our erosion resistant coatings are currently being utilized in a wide array of industrial applications. Many components are coated with our coatings within industries such as Pumping (impellers, casings, covers. plungers) and Power Generation (rotors, diaphragms, blades) to name just a few. A&A Coatings has decades of experience providing customized thermal spraying solutions to different industries. If you would like more information please send us an inquiry or give us a call.